More logs have been recovered from last week. See below. Arrived at Cycladia or Blu Thua GI-B b55-2 this morning. A sight to behold for sure but I can't help but think the ringed "earth like" world that is the focal point of interest in the system, is viewed with more awe by commanders that have spent time on "Earth like" planets, some close to tears. Being bought up on a barren rock of a world seems to have diluted my emotional reaction to seeing such a place. After taking some pictures with my photo drones, I mapped the planet feeling it would be good practice for me. After which I moved on calculating the next set of jumps to take me to our next stop Labirinto. Definitely getting the hang of this Discovery Scanner and Full Spectrum System Scanner now, have even found a few systems that no other human has visited yet. Nothing particularly exciting but I was the first to see them which a reward for me in itself. It didn't take too long to get to Labirinto aka Traikaae CH-Y c10 and super cruised over 337ls to planet 1 a, a moon of interest orbiting a gas giant. As soon as I started my approach to orbital cruise I could see the famous canyons and mountains, giant gashes raked across the surface. I came in at a nice and shallow angle aiming for a particular mountain range that was listed on my scan as having geological activity. I allowed the ships computer to engage glide mode. Just for the record here, I - do - not - like - glide - mode! I may get used to it in time but as of now it is scares me, other seasoned planetary commanders will laugh I am sure, as the computer makes all the safety calculations but hurtling towards spikey cliffs at 4 km per second whilst the whole structure of the ship creeks and moans under the strain is terrifying! Anyway with glide complete and me back in control I flew down into the canyon at the bottom of the mountain range, following the scan signal. A fine cloud of dust started to drift in around the ship so I relied on my readouts and radar to find a suitable landing zone, took a while but then I was down on the surface. 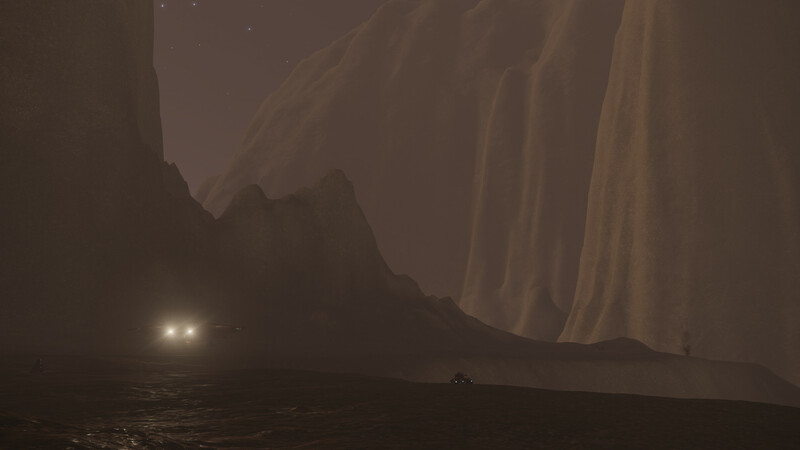 I peered through the dust and noticed my ships lights were illuminating 10 to 20 small outcrops. I clambered out of my seat and made my way to the SRV hanger to go and investigate. SRV on the ground, night vision and lights on, I slowly and carefully rolled out from under my ship and over to the outcrops. As I approached the first I nearly smashed my head on the back bar when it suddenly roared to life and started jetting, what I now know was water 20 to 30 meters into the air. Just as that one erupted as too did all of those behind it like some kind of automated fountain display. I eased the SRV back a bit and then switched my HUD over to analysis mode and powered up its composition scanner. Water Geysers, my first Geological discovery. I had a short drive around the canyon floor but realising I was actually on a plateau and there was more canyon below, I aired on the side of caution, still not being used to the SRV and returned to my ship. Only after using my vertical thrusters and slowly ascending out of the dark to the surface did I realise that the canyon was 11km deep! I flew around the planet for a few hours screaming down valleys hitting my engines boost and having fun watching the canyon walls race past my peripheral vision. I also touched down twice and scanned more geological points of interest, all of which were water geysers, before taking my leave and heading out of system to the next in my route towards Thors Eye.